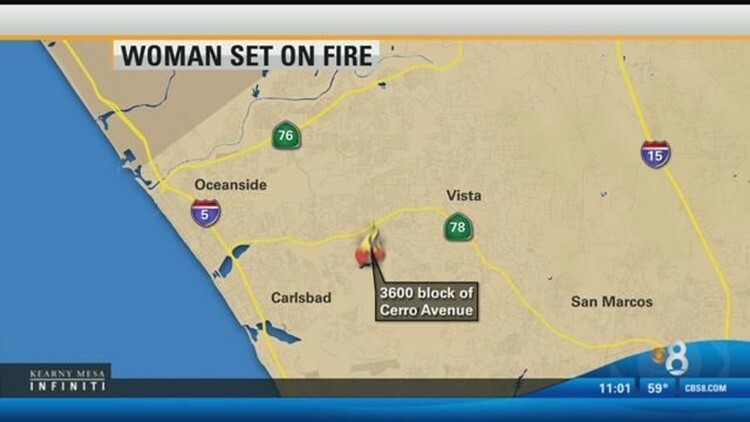 An man was arrested Friday night in Oceanside after he was accused of setting his girlfriend on fire. OCEANSIDE (CNS) - An Oceanside woman is recovering Saturday in a hospital from burns she suffered when her boyfriend allegedly poured gasoline on her and set her on fire Friday, according to police. Officers and paramedics responded to the 3600 block of Cerro Avenue in Oceanside at about 3:30 p.m. Friday, where the unidentified woman was treated for significant burn injuries and transported to the UC San Diego Medical Center Burn Unit in San Diego, said Oceanside Police Officer Ryan Keim. She is expected to survive. on suspicion of one count of attempted murder and one count of felony domestic violence, according to Keim. it on the victim and lit her on fire using a lighter.